No matter where you look in Australia you're more than likely to see a eucalyptus tree. Scrawny or majestic, smooth as pearl or rough as a pub brawl, they have defined a continent for thousands of years, and still shape our imagination. Indigenous Australians have long woven myths about the abilities of the eucalyptus. Since Australia was colonised, botanists have battled for more than two hundred years in a race to count, classify and own the species. This is the story of that battle and of other eucalyptographers – explorers, poets, painters, foresters, conservationists, scientists (and engine drivers) – who have been obsessed by them, championing their powers. Gum trees have promised to cure malaria, solve the drainage problems that had defeated the Roman emperors, forest the Sahara and divine gold. 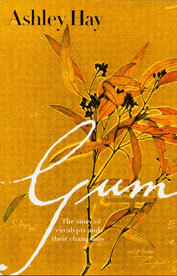 Gum is about a magical, mythical, medicinal tree. More than that, it's the story of new worlds, strange people and big ideas.